Ash and I needed to do some planning for our mom’s 60th birthday dance party, and her husband Brock had the weekend off, so I lured them to the Westside with a promise of food. Making sushi was Brock’s idea, and he was quite the roller in fact. 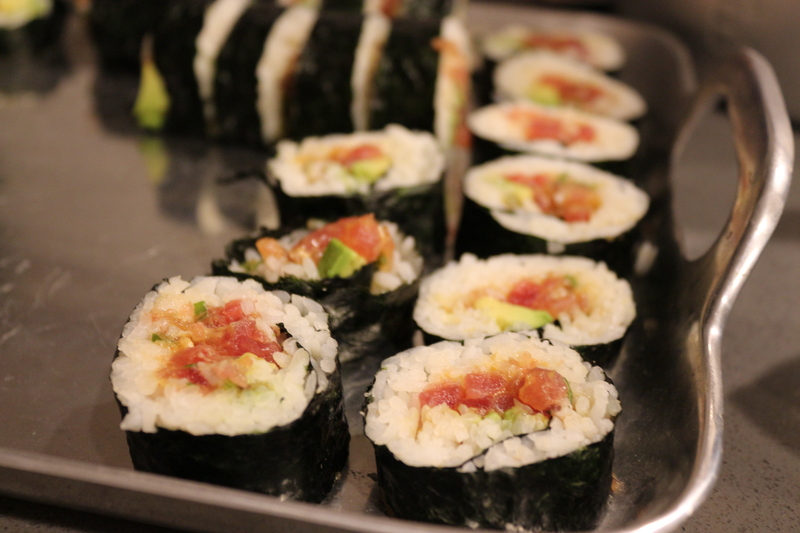 Below is a recipe that makes 4 spicy tuna rolls. 2. When the rice is done cooking, let it cool, and then stir in the vinegar and sugar. The rice should be room temperature when making the rolls. 3. Prepare the spicy tuna filling: Cut up the tuna into small dices, removing any tough parts. Put in a small bowl. Mix in the mayo, Sriracha, sesame oil, green onion and sesame seeds and stir well to combine. Taste to see if the spiciness is to your liking. If you want, you can add more Sriracha. – Cover your bamboo mat with a piece of plastic wrap. Then lay your first sheet of seaweed shiny side down on your bamboo mat covered with plastic wrap. – Moisten your hands with water and get a ball of rice about the size of 2.5 golf balls. Spread the rice in a thin later over the sheet of seaweed, leaving one edge rice free so you can seal the roll. – Spread a quarter of the spicy tuna mixture across the center of the rice horizontally. If you are using avocado, spread a few slices across the top. – Moisten the un-riced part of the seaweed with a little water. Use your mat to roll the seaweed/rice/tuna over, open the mat, and then finish rolling until the moistened side of the seaweed seals it shut. Then use your mat to tighten the roll. – Remove the plastic wrap. Using a very sharp knife, slice the roll into circles. Repeat with the rest of the filling (you will probably have extra rice), and serve immediately with soy sauce and wasabi. This entry was posted in Mains, Sides, Snacks and tagged Asian foods, Gluten Free, rice, Seafood, SPICY. Bookmark the permalink.